Going Up North - a true Michigan statement that conjures up images of camp fires, sand dunes, miles of trees in every color of green, beaches, sunrises and sunsets, mosquito's and black flies. We arrived in Grayling, on Monday afternoon with just enough time to set up before heading to Mt Pleasant to have dinner with Tina, Jim, Jackie and Jillian Oliver at Cranker's Brewery. Tina was a steward in the Midland unit that Les used to represent. When Les would stay in a local hotel while negotiating, they would come to visit him so the girls could swim. It was great seeing them again and catching up on their lives, the "girls" are now college students. Before getting into all we did here, we forgot one thing on our Farmington post, we had breakfast with Shirley Lightsey at the Breakfast Club. A favorite place to eat in Farmington and Shirley is one of our favorite people. She was Les's boss way back in the early 80's when he worked for the Detroit Water Department and we were so very glad we could meet up with her on this trip. With only 3 days in Grayling we had to get as much in as possible each day. One day we hit the CCC Museum (Civilian Conservation Corps), a drive around Houghton Lake, Camping World for a new toilet and then the Headlands Dark Sky Park at night. The CCC Museum was really interesting. Nancy's dad was a part of this program in the early 40's. The CCC ran from 1933 to 1942 and the basis for starting it was to "put America back to work". More than 100,000 men performed a variety of conservation and reforestation projects. 484 million trees were planted, and they constructed 7,000 miles of truck trails, 504 bridges and 222 buildings. The property has a circled walkway that takes you past the exhibits. It started with two types of fire towers that were used. 140,000 days were spent fighting forest fires. 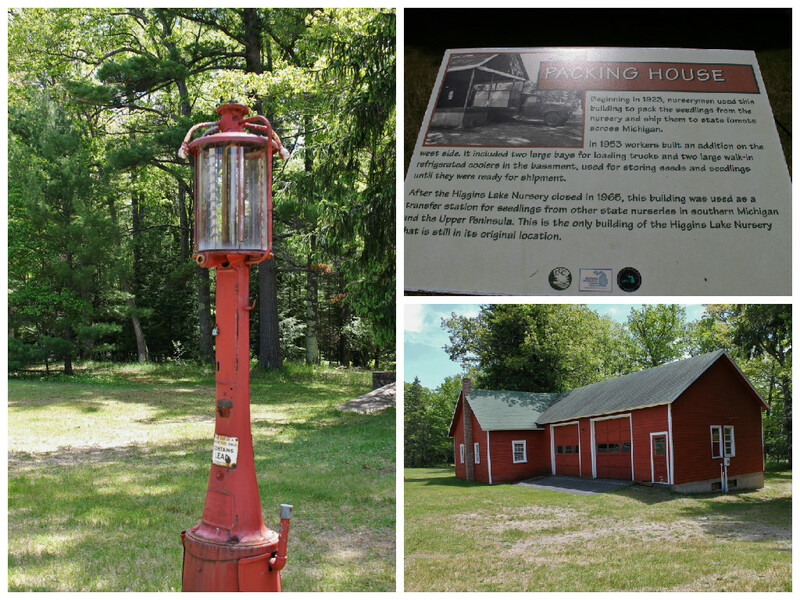 The Packing House was used to pack the seedlings from the nursery and ship them to state forests across Michigan. In 1953 an addition was built on the west side. It had two large bays for loading trucks and two large walk-in refrigerated coolers in the basement, used for storing seeds and seedlings until they were ready for shipment. The coolers replaced the Ice House. This is the only building of the Higgins Lake Nursery that is still in its original location. Ice was used to keep the roots of the seedlings from drying out and dying. Once ice on Higgins Lake reached about one foot in thickness, ice cutters sawed out large blocks and stacked them in the ice-house. Each layer of blocks were covered with sawdust to keep the ice from freezing together. Sawdust insulation in the one foot think hollow walls kept the ice frozen throughout the hot summer months. There is a small tree growing under the stairs. 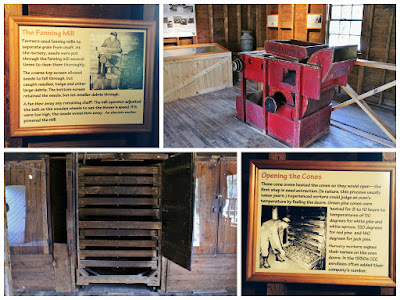 The cone barn, houses the ovens that were used for drying the pine cones, a large tumbler, rubbing screens, a fanning mill and a loft for cone storage. After the seeds were tumbled from the cones, workers wearing leather mitts rubbed them over the screens to remove their wings. The seeds fell through and the wings and debris stayed behind. There were special screens for each type of seed. Tumbling heated cones released their seeds. This was turned by hand and the seeds fell to the tray below. It took about half an hour of turning to remove the seeds from a bushel of cones. This produced enough seeds to plant two seed beds. 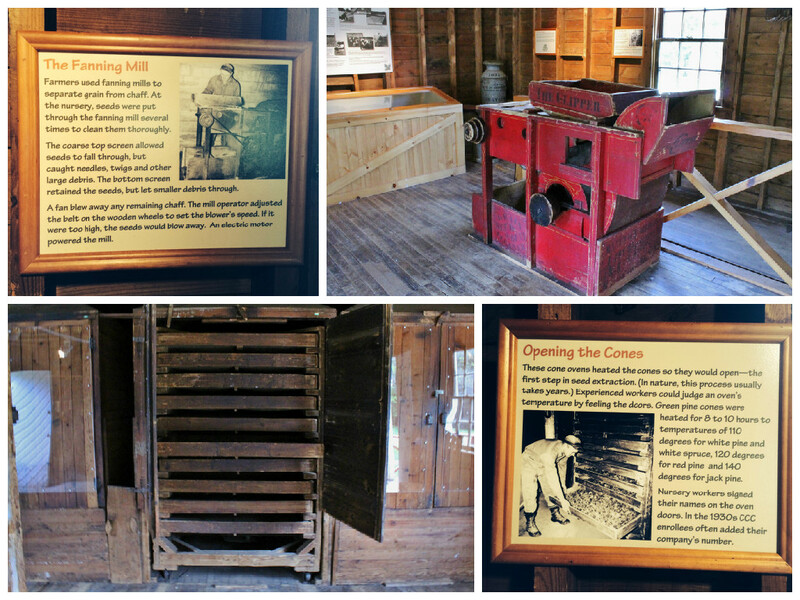 The Fanning Mill was used by farmers to separate grain from chaff. 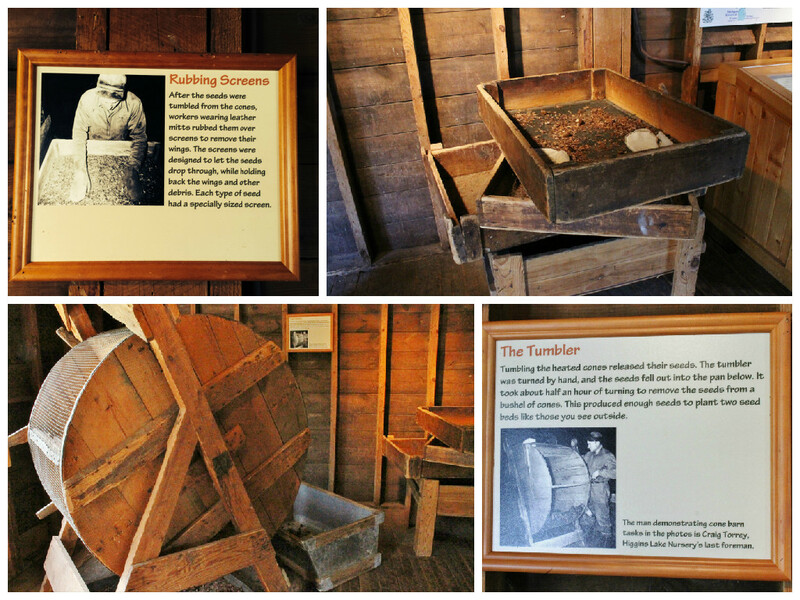 Seeds were put through the fanning mill several times to clean them thoroughly. The cone ovens heated the cones so they would open. The first step in seed extraction. Experienced workers could judge an ovens temperature by feeling the doors. Green pine cones were heated 8 - 10 hours to temps of 110 degrees for white pine and white spruce, 120 degrees for red pine and 140 degrees for jack pine. 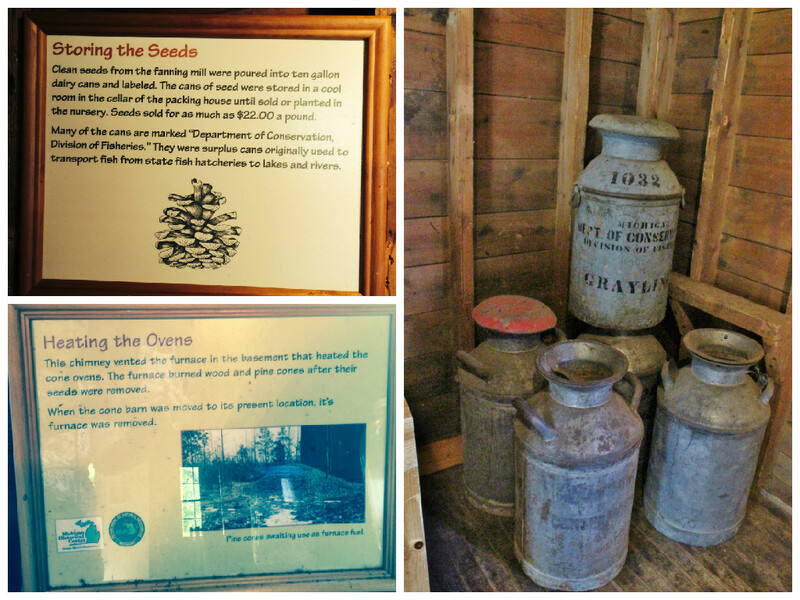 Seeds from the fanning mill were poured into ten gallon dairy cans. They were stored in a cool room in the cellar of the packing house until sold or planted. Seeds sold for as much as $22.00 a pound. To heat the ovens - a chimney vented the furnace in the basement. The furnace burned wood and pine cones after their seeds were removed. These are the types of seed beds used to grow the trees. Higgins Lake Nursery started with two acres in 1903 and by the 1950's was up to 48 acres. They helped to reforest Michigan during the Twentieth Century. Each 3 1/2 by 12 foot seedbed was planted with five and a half ounces of seeds. Depending on the tree species, this totaled between 9,100 and 77,000 seeds per bed. The trees grew in the beds for two years , seedlings were removed, packed into bundles of 1,000 and shipped to state forests to be replanted. Living conditions were sparse. At first, enrollees lived in tents until barracks like this reproduction were built. Based on an army barracks plan, they were covered with tar-paper and batten siding and asphalt roll roof. Most had no indoor plumbing, and the only heat was from a wood-burning stove in the center of the room. About 40 CCC enrollees lived in close quarters in a barracks this size. This building houses the museum, which has 100's of pictures of different CCC crews, samples of tools used, a mock up of what the bed areas looked like and much much more. We took the scenic route to Camping World in Houghton Lake, enjoying the lake and scenery on the way. When we arrived in Grayling on Monday and set up, we discovered the repairs to the toilet that Les and Mike did were not the answer to the problem - we still had a leak. After discovering it would be almost $300 to have them repair it with no guarantee it would work and $100 for the last part it might be, we opted to buy a new toilet for a little under $200. After all of that we headed to the Headlands Dark Sky Park, west of Mackinaw City. It is one of 20 Dark Sky Parks in the world, with lighting conditions just right to see the most stars. The Northern Lights have been seen from this park. We did not see those but we did see a spectacular sunset and a full moon that was so bright we could see our full shadows. The moon did hamper some of the star gazing but we were still able to see a lot of stars. The staring gazing area is down a long and winding road that features cultural docents, indigenous artwork and regional photography. Each Discovery Station represents one of the planets, plus Pluto, and the Moon and the Sun. At the end of the road you come to a parking area that has a short walkway to the 2 1/2 mile beach front. There is a grassy area to view from or you can walk the rocky beach. There is a section that has a fire bin and a number of benches to sit on. Bring lots of fire wood with you. Talking with a lady at the fire we discovered you need to stay until at least 1:30 am for it to get completely dark. That is when the sun is setting in North Dakota and has left our skies here. Who knew! We stayed until around midnight - but with the moon so bright we are not sure it would have made much difference. Either way it was a really great experience. Oh yeah - take a lot of bug spray with you. Sleeping Bear Dunes was our 2nd day, with a drive through Traverse City to get there. dune (okay not all the way). In reflecting later she did admit that it did seem so much easier back when she was a kid, but it was just as much fun. 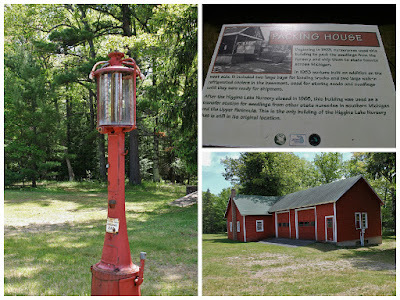 We drove to Glen Arbor and stopped for coffee at the Leelanaw Coffee Roasting Co. While there a gentleman came in who used to have an Airedale and we talked for the longest time about his dog. Mielikki starts many a conversation with people. 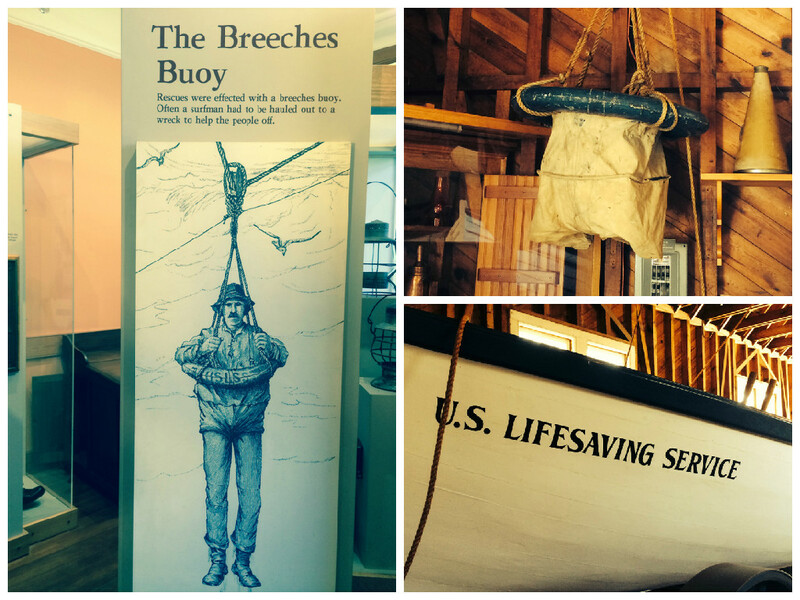 We went to the Coast Guard Museum in Glen Haven. Before being called the Coast Guard they were called the U.S. Lifesaving Service. It's a 7.4 mile self-guided auto tour that gives you insight in to the history of the area. A sampling of the vegetative communities in the park. Plus, spectacular overlooks of Glen Lakes, the dunes and Lake Michigan. Our final day here was spent visiting with Nancy's best friend Gail. They have been friends since kindergarten and no matter how long it has been since they last saw each other they can pick right back up where they left off. It was so great to be able to spend the day with her. We also did some home repairs, installed the new toilet, fixed the broken light switches and even got the laundry done. Next stop the U.P. - across the Big Mac and as of this posting we have no leaks and no ants! Ya-Hoo! ~ Make sure you have lots of bug spray with you. The mosquitos were pretty bad here and we have used a ton of spray. ~ Fire and bugs don't mix - so burn some wood and smoke 'em out. ~ Sometimes you just can't repair something and you have to replace it. Fortunately we had only invested $40 in parts into the toilet before biting the bullet and buying a new one.